When it comes to flash fundraising, time works with you and against you. Flash Fundraising is the art of harnessing a timely current event to raise money for your cause. It could involve a response to a natural disaster, a recently released childhood poverty study, or highly publicized comments on your cause by a celebrity. Whatever it is, you want to be ready to take action. We did exactly that at Team Rubicon—a nonprofit that deploys veterans in emergency response situations—following April’s 7.8-magnitude earthquake in Nepal. The earthquake happened on a Saturday, and we knew we had to mobilize our supporters to fundraise online that day. It was the difference between sending our veterans to Nepal in a matter of hours versus days. That’s why we immediately put out a call…and Lynn Le answered. Taking from the playbook of our friends at Pencils of Promise, we strategically targeted individuals like Lynn with our ask because they are what we call “network mobilizers.” They are very active on social media and effective at motivating people to take action. We knew these folks could mobilize their networks quickly in the name of Team Rubicon. We reached out to Lynn via text (her preferred contact method) with a link to create a peer-to-peer fundraising page through Classy. She got on board. 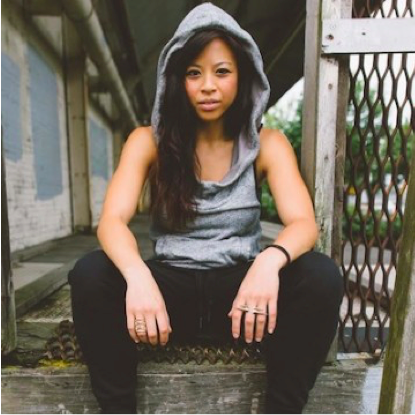 As a fitness guru, she even added her own personal burpee challenge to encourage donations. Tips to help her customize her Classy fundraising page and notify her friends and family. Lynn came out full force for Team Rubicon. Within the first 24 hours, she raised $1,500. She topped that off in the days following. She repaid her backers in burpees…a lot of them! 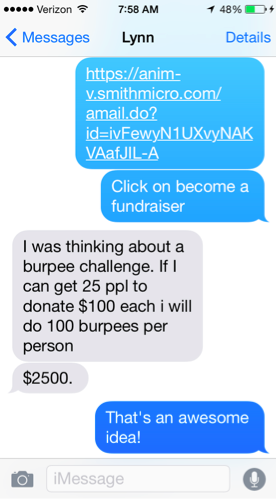 I encouraged her to take a video of those burpees as a way to show her commitment and thank her supporters. 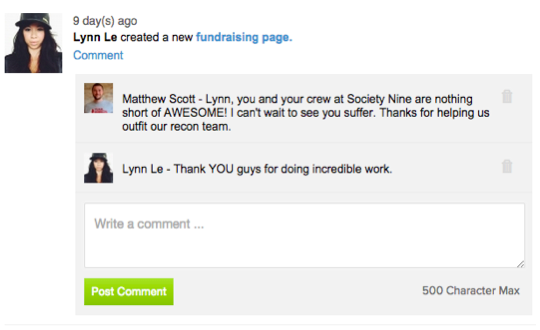 We, of course, wanted to credit Lynn for all of her hard work and dedication. In addition to personally calling to thank her and sending a handwritten thank you card, we showed her some love through Classy’s comment feature. Lynn was one of many Team Rubicon supporters who flash fundraised for us in the days following the Nepal Earthquake. 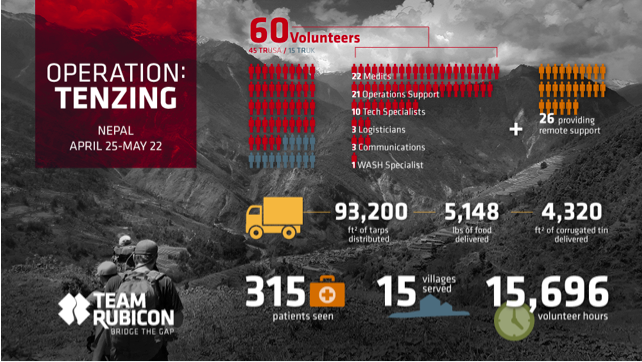 All in all, Team Rubicon raised more than $313,000 through Classy to support our operation in Nepal, which included the deployment of 60 volunteers performing 15,696 hours of service to 15 villages. We knew it was important for our supporters to know the difference they made to the people of Nepal. That’s why we sent them this infographic to show them what their time and donations achieved. Act Fast: You have to act fast if you’re going to use a current event to fundraise. 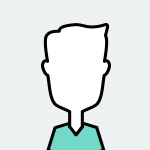 Include a sense of urgency in your appeals to supporters. Target Network Mobilizers: These supporters have the networks to share your message with a wider audience. It’s critical to reach as many people as you can when the clock is ticking. Equip Your Supporters: Give them strategic information and graphic assets to demonstrate need. Show Some Love: We can’t overstate the importance of thanking donors in both the old and new school way. Yes, send them a thank you email, but also call them personally and send a handwritten card. Demonstrate Impact Quickly: Once your impact as an organization is clear, send your supporters an update. Show them what you did with their donations and why it matters. This is where storytelling comes in. Matt Scott is the senior development officer for Team Rubicon. Team Rubicon is dedicated to uniting the skills and experiences of military veterans with first responders to rapidly deploy emergency response teams. You can see Matt in action at Dreamforce 2015 by attending Millennial-Powered Missions: Secrets Behind the Top 5 Millennial Campaigns and Fundraising: Innovative Ways to Manage Incoming Funds – and Get More to Come In. Follow Matt on Twitter at @MattBBA or engage @TeamRubicon.